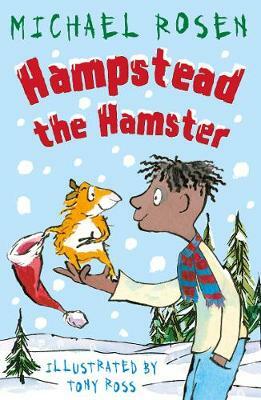 Christmas is coming, and what Leo wants more than anything in the world is a pet hamster. And guess what? He gets one on Christmas morning! Leo names his new pet Hampstead, after an autocorrect mistake on his wishlist. Everything is great, that is until Leo realises that Hampstea... read full description below. Michael Rosen (Author) Michael Rosen is one of the best-known figures in the children's book world. He is renowned for his work as a poet, performer, broadcaster and scriptwriter. He visits schools with his one-man show to enthuse children with his passion for books and poetry. In 2007 he was appointed Children's Laureate, a role which he held until 2009. While Laureate, he set up The Roald Dahl Funny Prize. He currently lives in London with his wife and children. Tony Ross (Illustrator) Tony Ross has been illustrating books for over 40 years, and has been published all over the world. He is perhaps best known for his much-loved Little Princess series, which has been adapted for TV and is currently showing on Channel 5s Milkshake, and for his collaboration on David Walliams' best-selling children's books. Tony's books have been shortlisted for the The Laugh Out Loud Book Awards (Slug Needs a Hug) and the Kate Greenaway (Dr Xargle's Book of Earth Tiggers), and Tadpole's Promise won the Silver Medal Smarties Prize. He has been named as the best-selling illustrator in the UK for three years in a row, and he is the UK's libraries' most-borrwed illustrator. He lives in Rutland.